Do you sit at a desk all day? This 3 for Thursday is for you. Sitting on the edge of your chair reach out over your desk allowing your middle back to sag to stretch your shoulders and upper back. Hold for 15-20 seconds. Repeat 2-3 times a day. 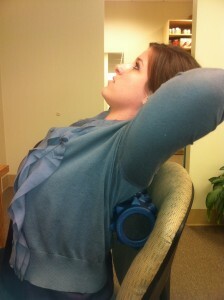 Sit tall in your chair with a towel or lumbar roll in your mid back. With your hands behind your head stretch back over the roll to stretch your chest and upper back. Hold for 15 seconds, 2-3 times per day. Stand up. 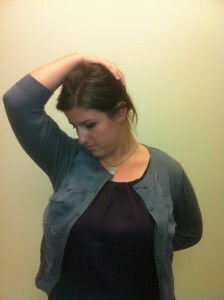 Pull your Left arm down behind your back, and use your right arm to gently pull your head down and to the right. Turn your head to the right as well. Hold for 15 seconds, repeat 2-3 times per day. A mid morning exercise session in the office can be quite helpful, and can be done in 15 minutes. 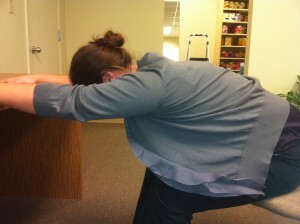 Try these office exercises from Taryn Cohn to improve postural strength, decrease tension and be more productive at work. Finally, if you are like me, the 3 o’clock hour is the witching hour. This is the time that the eyelids get heavy and the yawning begins. Avoid the afternoon slump with these tips from Reader’s Digest.